Back in the olden days, when the internet was still a madcap idea and meals came largely in cans, advertising a product was fairly straightforward (despite what Madmen may lead you to believe). With single brand names and iconic commodities like Hoover, Post-It and Jacuzzi monopolising markets, persuading consumers to choose your product was simply about any advantages it had over the existing behemoths. Unsurprisingly though, things have moved on in the world of marketing. Now in 2016, the age of Instagram stories and live tweeting, the entire manner in which companies are advertising, and who they are advertising to, has completely changed. Instead of extolling the benefits of a product with very little market competition, brands have had to flip their strategies completely, in order to stand out from an ocean of similar items. In other words, rather than selling their products, companies are now having to sell themselves. This is a phenomenon known as ‘Brand Affinity’. The feeling of community and personal connection between a consumer and a particular brand. Once an abstract term bandied around by power-suit wearing, espresso swilling executives, the ‘brand’ is now a vital part of surviving in an oversaturated market, with the product becoming almost secondary. 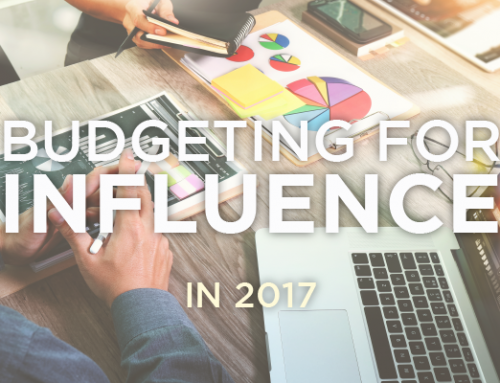 In the digital age, the easiest way to reach out to the consumer and begin to cast the spell of brand affinity is, unsurprisingly, social media. 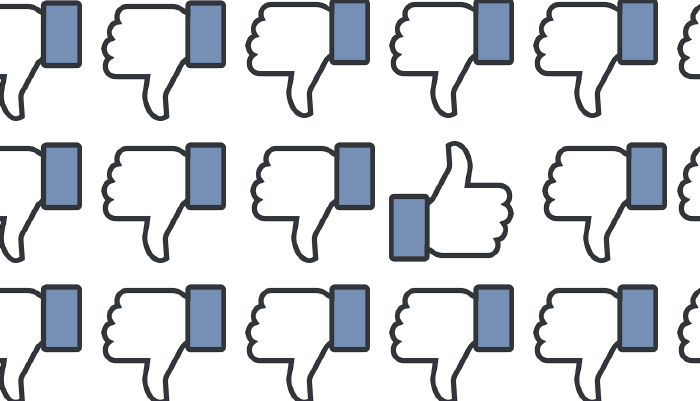 As people who spend an indecent amount of time festering in the unfettered corners of multiple social channels, we have come to learn a thing or two about the glorious hits and unfortunate misses of professional social media marketing. 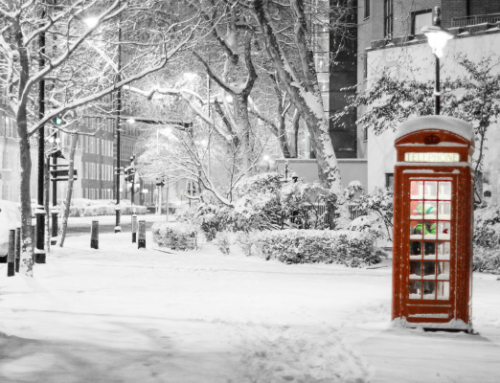 Here are case studies of two very different companies that we think have got their strategy spot on, and the lessons to be learnt from how they do it. 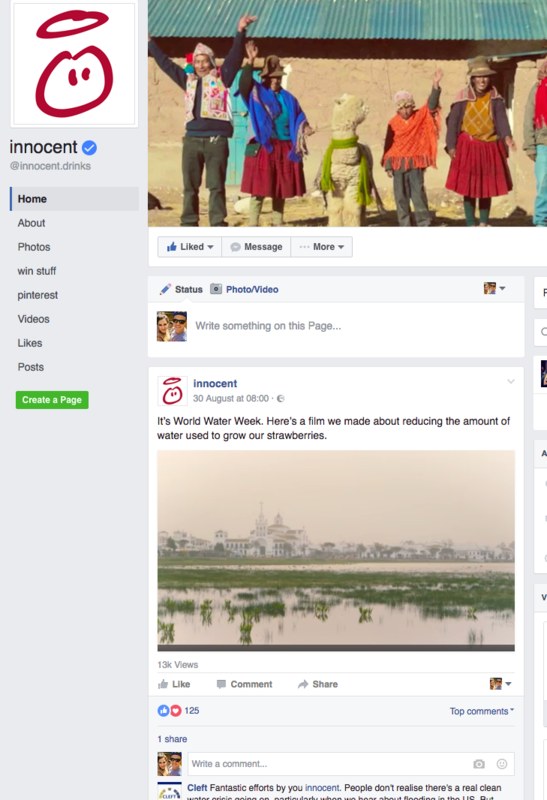 The biggest mistake that a social media manager can make is to lazily schedule the same posts across all channels. Yes, we’ve all been there, having found a particularly good raccoon meme and desperate to share it with the world, but it is important to remember that the format, focus and following of each social channel is completely unique. 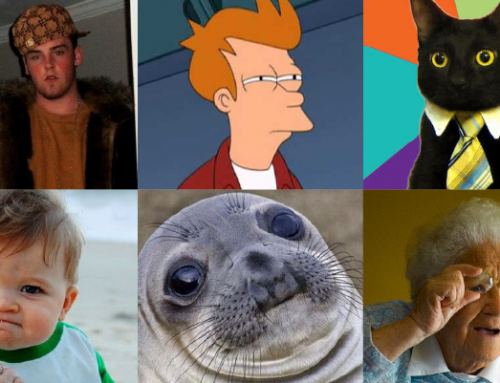 Facebook is better suited to GIFs, videos and longer text, whilst twitter has to be snappy and hashtag-able. Instagram is for idealised, attention-grabbing visual content, but snapchat has to have a sense of humour. Getting a handle on this is very time and energy consuming, but is extremely worthwhile if executed right, which Innocent definitely do. 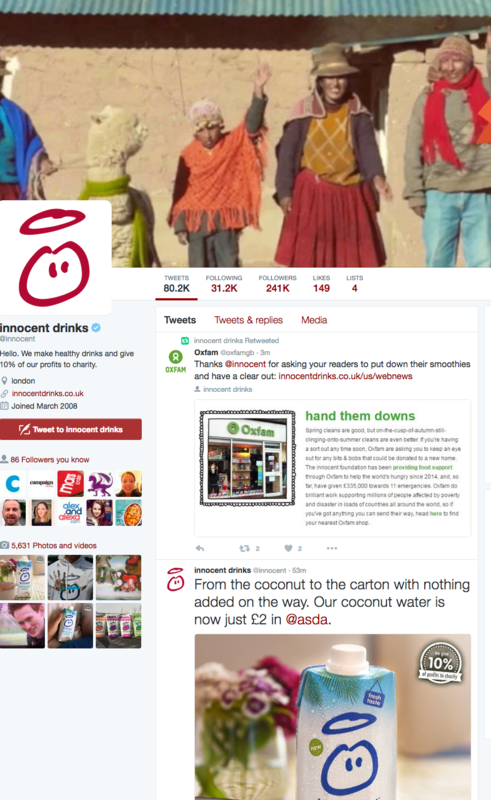 If you asked any of Innocent’s 241,000 twitter followers what is so loveable about their social content, the followers would undoubtedly cite brilliant wit and sense of humour. A brand that laughs at itself and the world around it is immediately more attractive to the potential consumer. 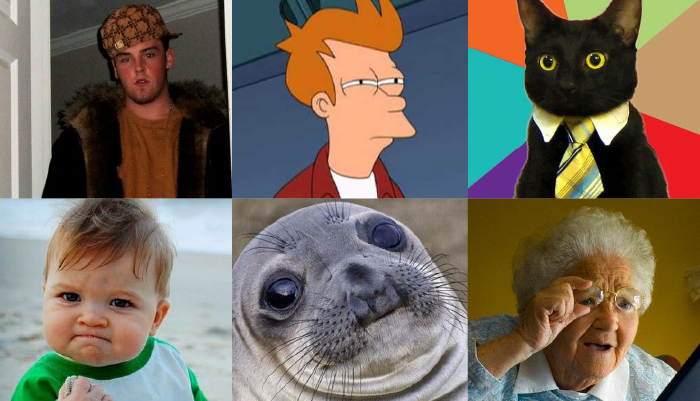 Humour is especially effective when used over several posts at once, as it creates the illusion of shared, in-jokes. 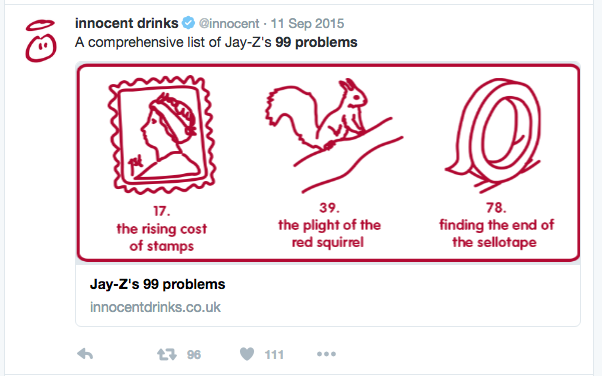 For example, Innocent’s famous ‘Fourth Floor Stapler’ series and ‘Jay-Z’s 99 Problems’ lists have each been retweeted, shared and liked hundreds of thousands of times. 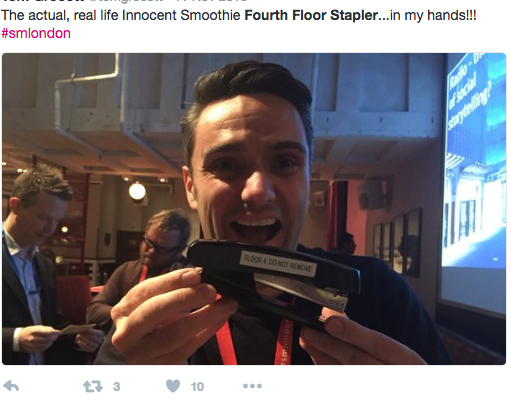 The stapler even puts in appearances at social media conventions now. You might even say it’s become a staple of the London social scene (sorry). Don’t get us wrong, Hootsuite and Buffer App are our guardian angels for organising social posts, but Innocent brilliantly displays that nothing beats a bit of spontaneity when it comes to maximising engagement. 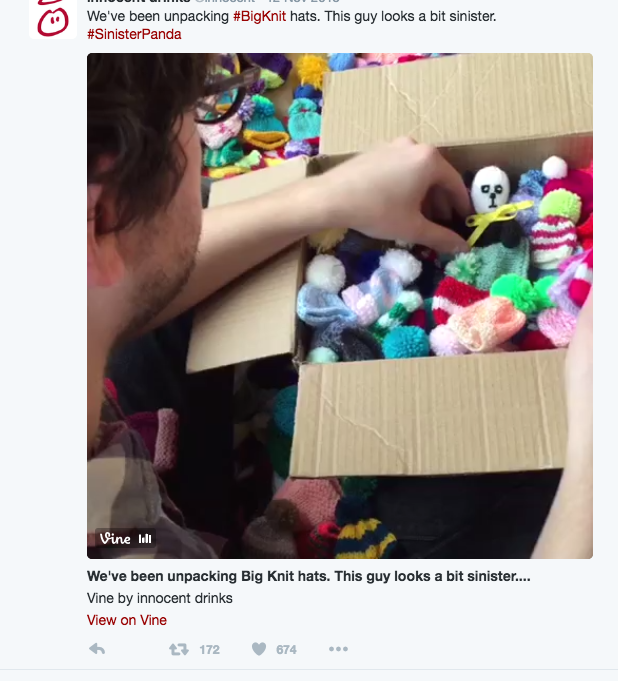 A fantastic example of this is last year’s Twitter and Facebook series charting the adventures of a certain ‘sinister panda’, a particularly unsettling donation to the company’s ‘Big Knit’ campaign, which was demonstrably a spur-of-the-moment concept. 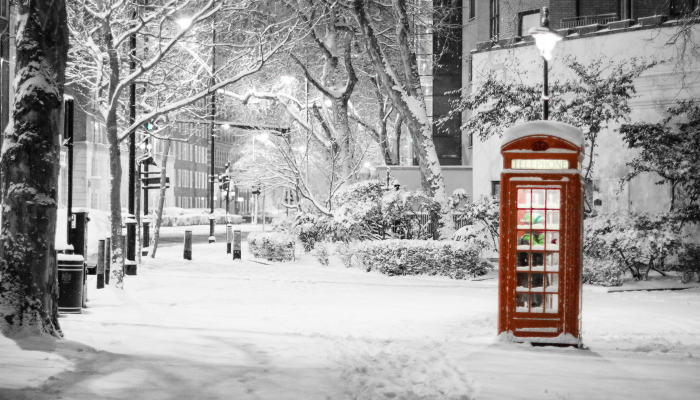 It is widely known that Innocent are owned by Coca Cola, and no amount of David Gandy ads and jolly, nostalgic santa lorries are going to mask the fact that Coca Cola is one of the most globalised, conglomerate super-powers on planet Earth. However, Innocent manage to gloss over this seamlessly by keeping their social content relatively local, and just the right amount of patriotic. 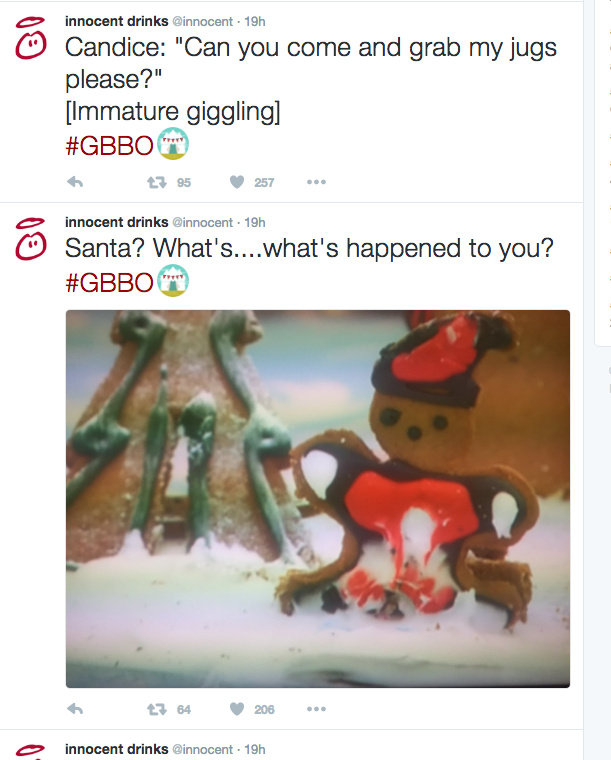 A great illustration of this is their recent, emphatic tweeting about the beloved Great British Bake Off – by doing so, they remind followers that despite their global dominance, they are a British brand and value the same things as their largely British audience. Aside from sounding like an upcoming Channel 4 show presented by Kirstie and Phil, this lesson is possibly the largest to be learnt from Innocent. It is not an exaggeration to say that they react and respond to almost every tweet, mention and comment they receive, and seem to pay special attention to those of ‘ordinary people’ rather than seeking out influencers to engage with. Needless to say, this creates a connection between brand and consumer that levels the two and opens a discourse. 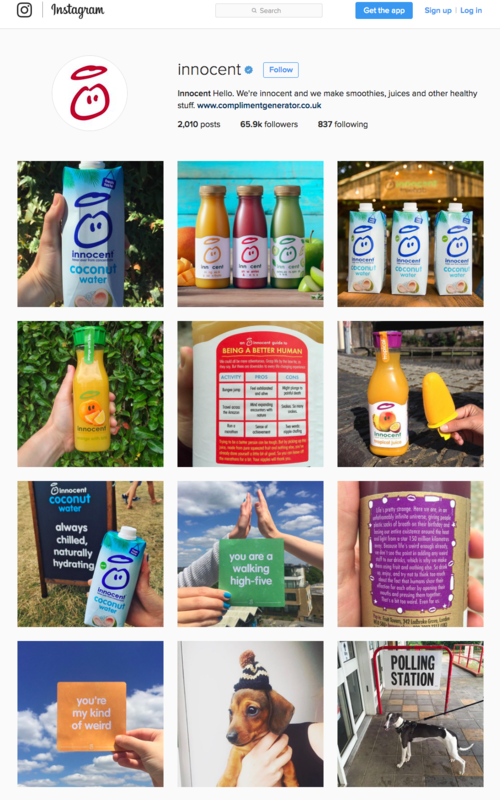 In every 20 tweets by Innocent, roughly only one is directly related to their product (which, in case you had forgotten, is smoothies and coconut water). This is a counter-intuitive marketing strategy, as of course a company will naturally feel compelled to wax lyrical about its product or service’s unique benefits. However, it is an incredibly powerful game to play. 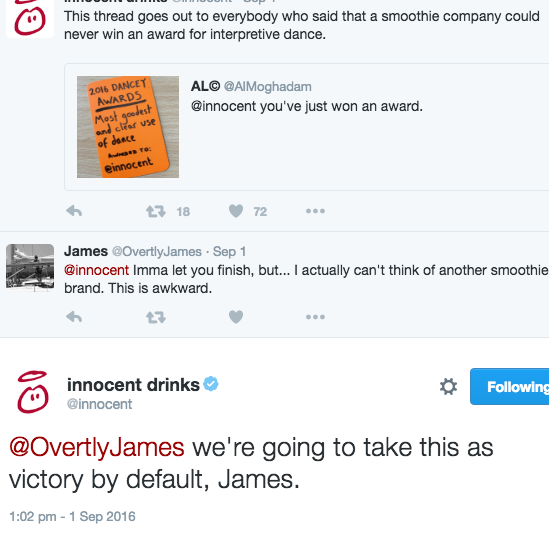 A noteworthy feature of Innocent’s occasional product tweets is their blatant self-awareness – often using transparent phrases like ‘this is just a reminder to buy our smoothies’. This works wonders for brand affinity, as it creates the illusion that Innocent are positioned on the same side as the consumer, and are just as jaded and exhausted by having to advertise as their audience are by constantly being advertised to. 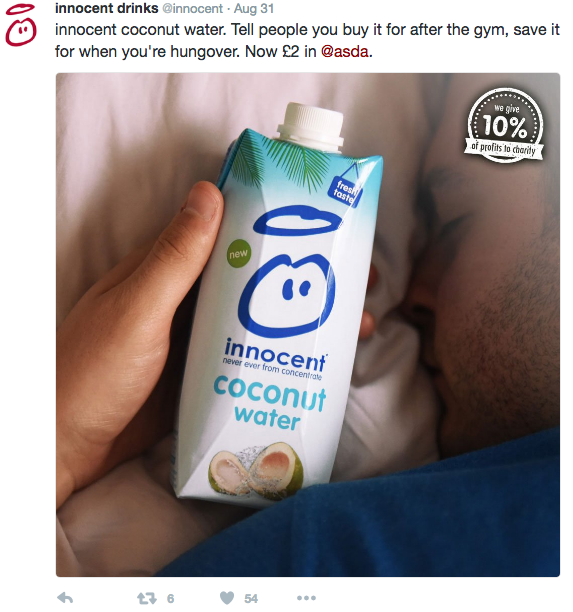 Whereas Innocent’s brand could legitimately appeal to anyone, Paddy Power’s key demographic and pool of potential customers is much more niche and specific. Because of this, the online betting giant focuses its attention on the social channels that will best allow it to reach them, namely, Twitter and Facebook. 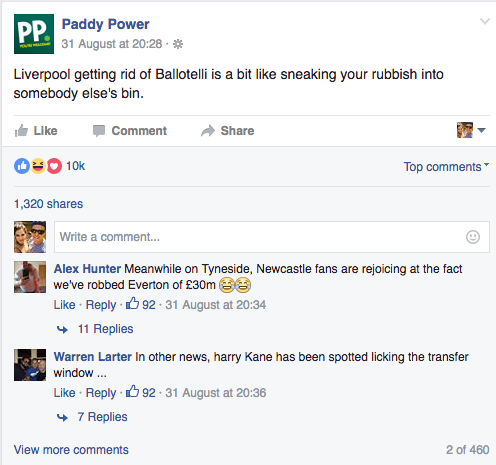 Paddy Power also ensures that its social content is much more targeted – rather than tweeting about everything and anything, a la Innocent, their feed is peppered with almost exclusively sports-related posts, memes, vines and comments. 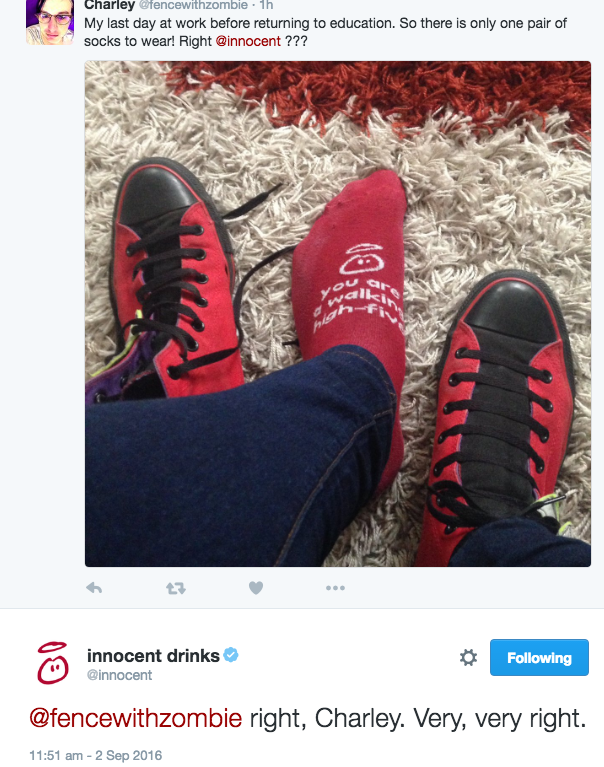 If Innocent are a team of people-pleasing, cute-animal-sharing, affable jokers, Paddy Power are more agent provocateurs. They know that a little bit of opinionated stirring of the pot gets the likes, favourites and retweets rolling in from their followers, and any negative comments will be swallowed up in an ocean of jovial agreement. 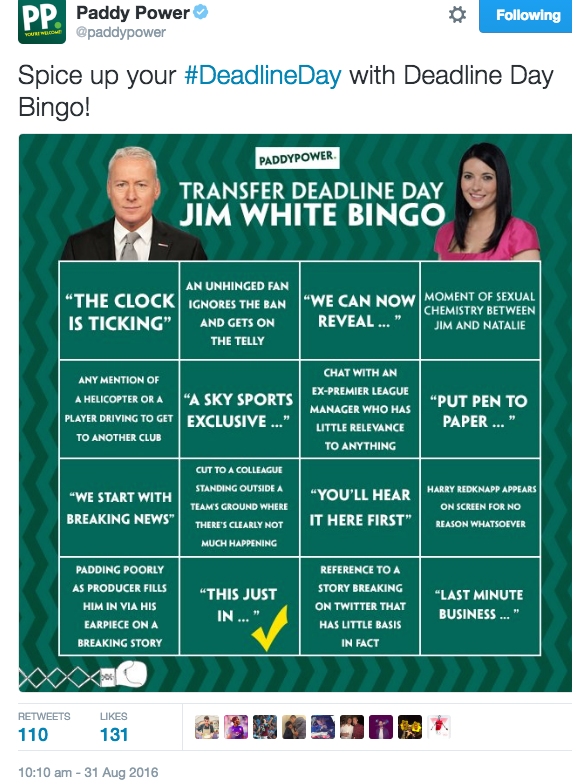 Within this whirlwind of seemingly arbitrary sports star dragging and amateur photoshopping lies a very calculated motive – to create an atmosphere of community between Paddy Power and their 600,000 followers (significantly more than any other betting company). In the way that discussing last night’s match builds a bond between otherwise casual acquaintances, the ability to mock, criticise and commentate on a communal interest (namely sporting events) is invaluable in creating brand affinity. Paddy Power has somehow managed to make itself into everyone’s opinionated, slightly drunk, exhibitionist friend at the pub, the kind that you’d introduce to others using the phrase ‘such a legend’. 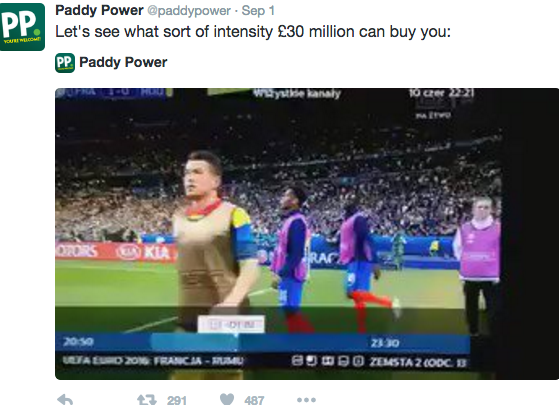 This is furthered by the fact that Paddy Power often post in first person. 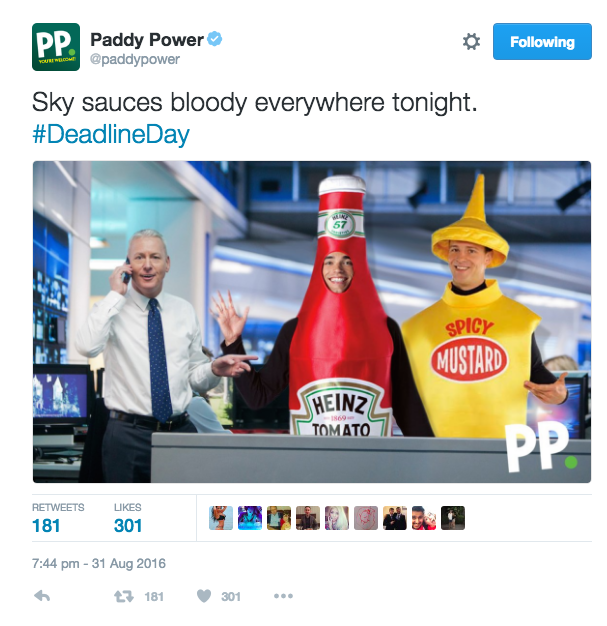 Paddy Power has a seemingly endless talent for quick curation and creation of visual assets, and a very distinctive way of branding them. 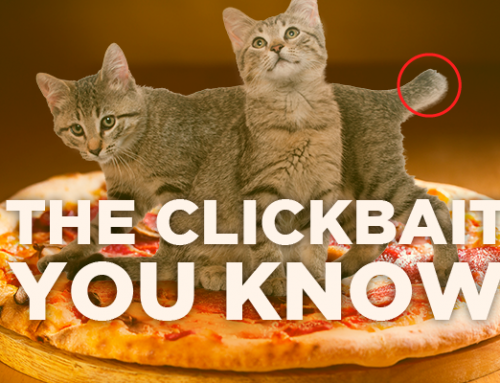 Like a unique fingerprint, the company’s trademark, green, slightly haphazard digital frames and logos on most visual assets serve to subtly further the brand, whilst maintaining its identity as a jokey, wannabe pundit. Tweeting celebrities is something we have all secretly done in moments of extreme desperation and starstruck idealism. However, Paddy Power makes a point of harassing celebrity twitter users, in the way that you used to prank call the local takeaway with your mates when you were 12. This is yet another strategy to ultimately bring the company to its followers’ level, to position it as ‘one of the lads’, getting the same baffled reaction from the celebrities it targets as any one of its customers would. So, what ultimate points of reference can we glean from these companies? 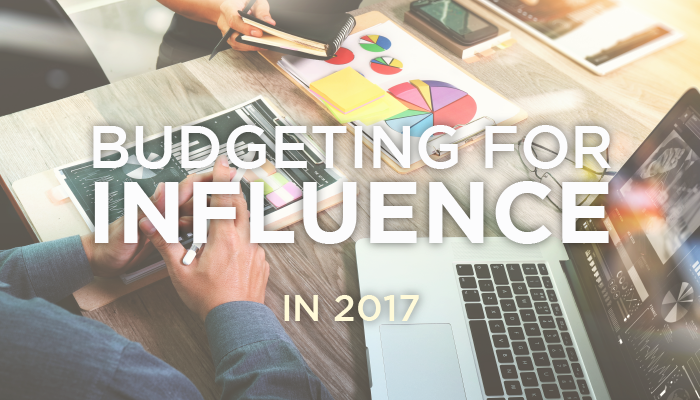 Firstly, it is key to know and understand your social followers inside out. This takes time, but is time well spent. Secondly, humour is essential to getting noticed, and not just any humour – the kind that will cause an undeniable good feeling within every potential customer it reaches. At the end of the day, in order for your brand affinity strategy to work, you need to ensure that yours is the first brand that comes to mind for any potential consumer. 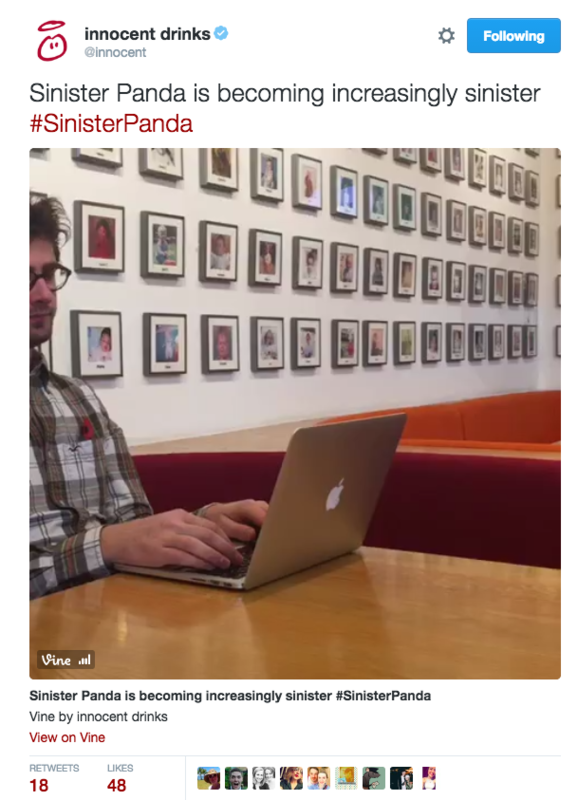 And yes, it turns out that sinister pandas and bad puns are a great way to do that. Joining SESOME in 2015 as in-house content writer after freelancing for a number of large travel companies, stringing words into sentences is Emily's raison d'etre. If she isn't furiously typing away at her desk, Emily can be found travelling (shocker), reading and occasionally knitting. 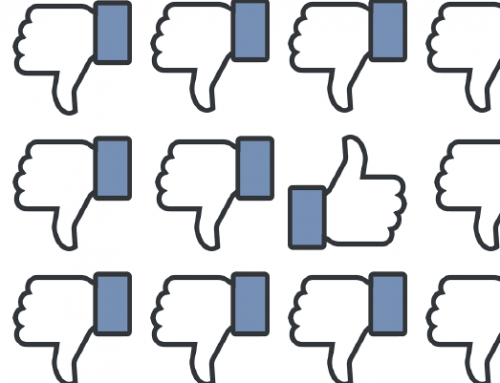 The Future of Facebook – An Old Dog with New Tricks? 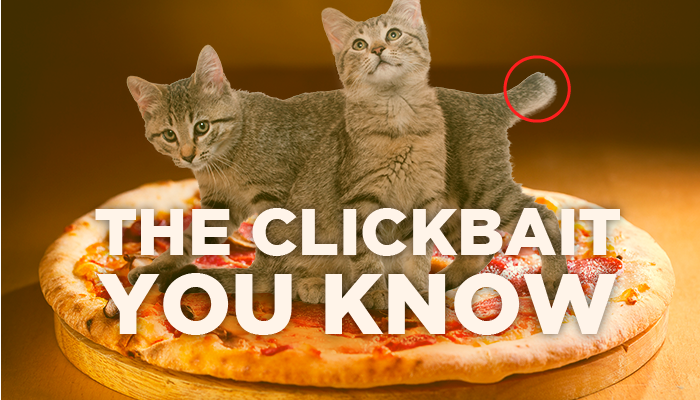 The 4 Clickbait Title Types You Need to Know (or maybe are already using)! My Organic traffic has dropped – what do I do?